The unusually mild spring weather followed by below freezing temperatures on April 10 and 11 combined to produce widespread freeze injury to landscape plants. The extent of plant damage depends on several factors, including temperature, duration of the below freezing temperatures, plant species, and stage of plant growth. See the article elsewhere in this issue for information about damage to vineyard grapes. Also see the ISU Extension & Outreach Yard & Garden column for April 13, 2012. 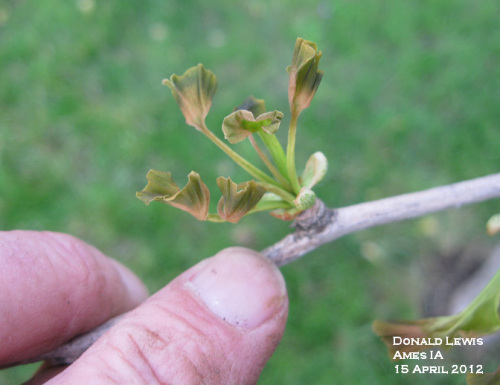 Newly emerged foliage is the most susceptible to damage from below-freezing temperatures and the worst-hit plants appear to be those trees that had just started to leaf out, including hackberry, saucer magnolia, and ginkgo. Symptoms of freeze damage include shriveling and browning or blackening of damaged tissue. Damaged growth often becomes limp. Eventually, damaged or destroyed leaves may drop from the tree or shrub. See the photos below. The majority of conifers appears to be unharmed at this time, though as new growth appears watch for wilting and browning of new growth. What can be done to help cold-injured trees? Not a great deal, in most cases. The good news is that the cold temperatures shouldn't have a long-term effect on most plants. Healthy trees and shrubs have the ability to re-leaf if the initial growth is damaged or destroyed. Healthy, well-established trees and shrubs should not be greatly harmed and will produce additional growth within a few weeks. This summer, water recently-planted trees every seven to ten days during dry periods to help recovery. Consider mulching the root zone as an aid to overall tree health. Remove dead branches, but be sure they are actually dead (i.e., dry and brittle) before making any pruning decisions. We do not recommend the use of fertilizers on trees or other ornamentals. 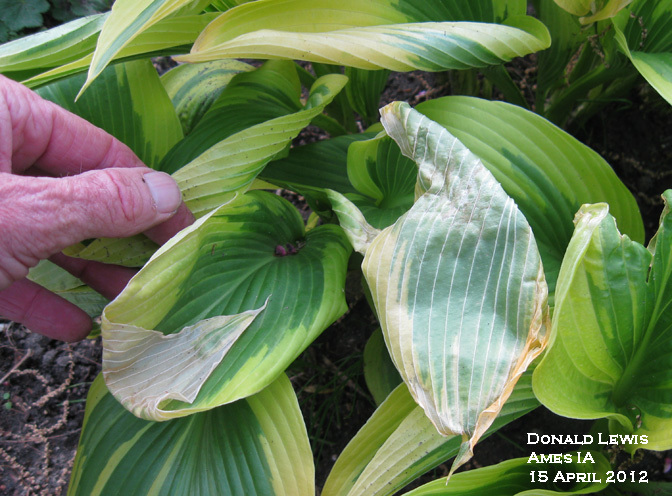 The freeze was damaging to some perennials, including hosta (photo below). Portions of the leaves have turned white and collapsed. Carefully remove damaged leaves and maintain good care through spring and summer to maintain plant health and vigor. Severely damaged plants will regrow from the crown or roots, but will be smaller than usual this summer. The cold temperatures may have damaged the flower buds of fruit trees. If the flower buds have been damaged, this year's fruit crop may be smaller than normal. Freeze damage to emerging ginkgo leaves. Freeze damage to hosta leaves. Links to this article are strongly encouraged, and this article may be republished without further permission if published as written and if credit is given to the author, Horticulture and Home Pest News, and Iowa State University Extension and Outreach. If this article is to be used in any other manner, permission from the author is required. This article was originally published on April 18, 2012. The information contained within may not be the most current and accurate depending on when it is accessed. Freezing temperatures in May damaged my potato plants. Will I need to replant? A hard freeze in early spring damaged the newly emerged growth on several trees and shrubs. Will the plants recover? Is it safe to eat rhubarb after the plants have been exposed to freezing temperatures?